Sceptical at first, but beyond impressed! I have struggled to find a holster that I can carry with whatever I wear. I was unsure at first that i could wear this with my full size firearm, and not have it be too heavy. The way that it sits while carrying allows for a comfortable carry at 0400, 0300, and appendix. With or without a belt, and even like it says; in gym shorts. The gun does sit a little bit lower while carrying appendix, but I found this to be helpful especially when bending or sitting down. 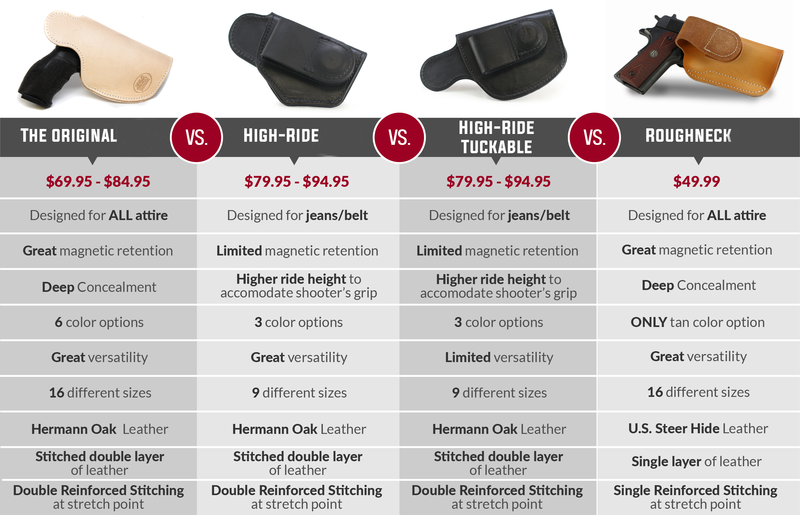 If you like a higher sitting holster, you can still obtain it with this. You carry with a belt, and put the belt over the magnet (magnet in between your pants and belt) and the holster will sit up higher and wont move on you. I am beyond impressed with this product and will be purchasing several more for family members.